Services - E Technologies, Inc. Proper preventive maintenance reduces the risk of UPS failure through thorough inspection, cleaning, testing and calibrating the various electronic and mechanical components of a UPS. 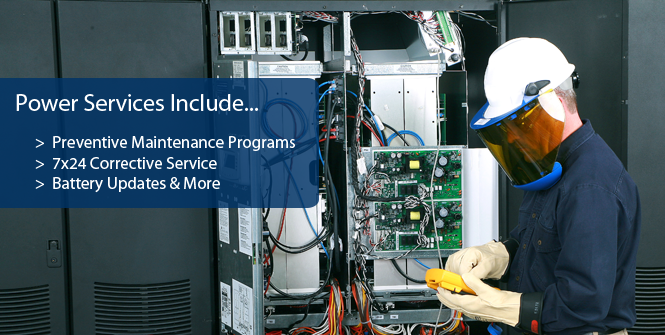 Preventive maintenance programs are designed to match the equipment and reliability requirements of each particular installation. Enhanced service contracts include parts, labor, and 7x24 corrective service visits so that you can rest easy knowing that calling for help will not require additional financial obligation. Our service is available 24 hours a day, 7 days a week when and where you need it. 7x24 Service includes a staffed dispatch and technical support capability for the most critical systems. Most corrective service is delivered directly from the original equipment manufacturer so you are assured of having the very best support available. Batteries continue to be the weakest link in any critical power system. Battery failure is the number one source of critical power system downtime. Insuring the integrity and availability of your batteries is essential. We provide high quality battery updates regardless of the make, model, or configuration of your power system. In addition to battery updates, many of clients install battery monitoring systems that continually supervise the health and availability of each individual battery so issues can be detected in advance of a failure.